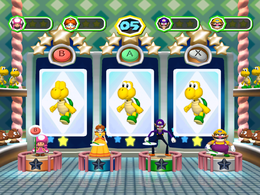 Odd Card Out is a 4-player minigame in Mario Party 6. This minigame's name is derived from the phrase "odd one out." This minigame appears on a page in the Miracle Book. The page is named "Crazy Card". The players cheer as the camera passes by them, each of them holding up a sign with a random button on it. Players have to press , , or depending on which of the three cards in front of them is different from the other two. The cards include common Mario enemies, which are Koopa Troopas, Goombas, Piranha Plants, Shy Guys, and Bob-ombs. Some differences are obvious (such as a red Bob-omb), but some are more subtle (such as the top of a Shy Guy's robe). Once someone picks a card, the round ends. If the player's choice is correct, he or she earns a point. However, the player is flattened by a Thwomp if the choice is incorrect, causing the player to miss the next round. Victory goes to the player who earns two points first. 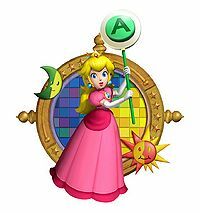 The card screens all show one part of a rainbow as the winner's platform glows and the players perform their winning or losing animations. These are all the different possible pictures that may appear in this minigame. Rules – "Find the card that's different than the others and press the correct button first to earn a point. Earn two points to win!" Advice – "If you answer incorrectly, a Thwomp will fall on your head and you'll lose a turn!" German Schau genau! Look closely! This page was last edited on June 24, 2018, at 01:27.